Learn from the experts what type of content you should be sharing on social media to get the results that your business deserves. We organize the content we’ll be sharing for a client into three primary categories including, Company, Community, and Industry. Content that would fall into the company category would include company news, events, products/services, company culture, noteworthy news about your employees, etc. Content that would fall into the Community category is any volunteer work/community initiatives a business is involved in, local events, other exceptional local businesses, and community issues that align with the company’s mission and ethos. Even if you are a national or global business, showing that you support and care about your local community can strengthen your value proposition and perception and an engaged community partner. Lastly, is the industry category which provides a business with the opportunity to share industry news and events. This category is the perfect opportunity to showcase expertise, thought leadership, and build relationships with peers within a respective industry. We’ve found that using these three categories keeps our team and the client focused and organized when working together to create monthly and quarterly social sharing calendars. I am a big fan of sharing resources that are useful without even leaving Social Media. That is, without having to visit the linked site. Here is a perfect example via Loganix. 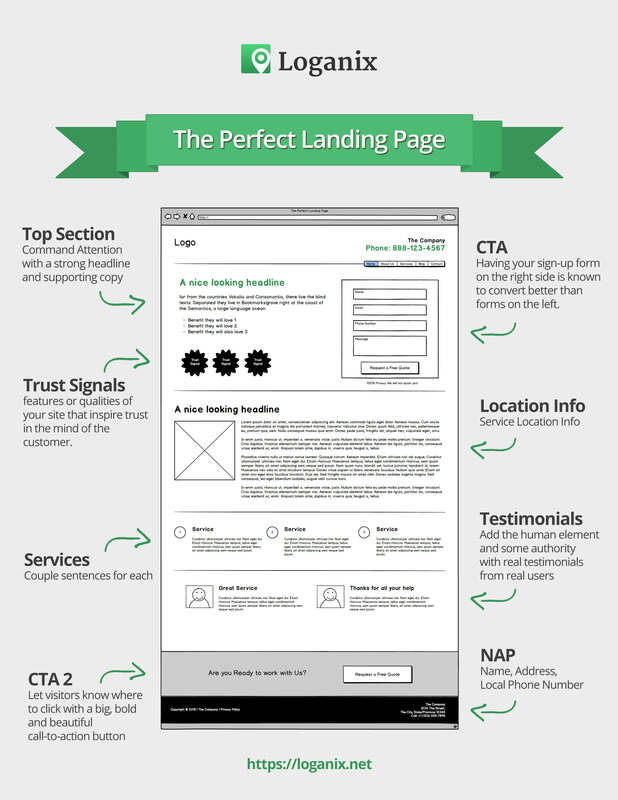 When I first saw this article shared, just seeing the image of the perfect landing page from this article show up in my Twitter feed gave me 90% of the value, and I followed these guys. They’d given me more than enough for me to click their link to find out what else could be gathered. When people are too self-promotional it doesn’t catch my attention or I can’t justify the click and redirection of my attention. Forget cat GIFs or videos of pranks gone wrong, the content you need to be sharing on social media has to provide value to your audience. Whether that’s via a social media post, a video, infographic, audio or the written word – the medium is less than important than the message. For example, if you’re a CRM company, you can share practical content on topics such as choosing a CRM provider, why you should switch CRM systems or how to implement a new solution. This type of content is focused on providing value to CRM managers and helps perform better and succeed in their jobs. If you can help your audience get better at what they do, they will thank you for it by rewarding you with high engagement levels (i.e. with comments, likes and shares), which in turn gives your content a greater reach. Ok, so…to decide the type of content you should consider what your competitors are publishing. There is a lot of noise on social media, so you should ensure that your posts stand out from the rest. This means that a huge source of inspiration comes from your competitors to find out what’s working and what’s not working. The first step is to identify some leaders in your niche, with a simple Google search you can do this. Then check their social media profiles and see what type of content works best. According to this research, you can find out both which type of content and which type of formats work better. I can’t say that there is a very good format and type that work for any brand, this depends on which niche you are in. For example, if you run a very visual type of brand, like restaurant, vacation agency, you realize people want to see food and destinations with pictures, so it makes sense to invest lots of time in producing high quality images but this doesn’t apply to an online publisher that focuses on news. People are on social media to connect, learn, laugh, and be entertained. So regardless of the niche your business or brand is in, you should try to hit on all of these things. Share your helpful content. Share other people’s helpful content. Post memes and GIFs. Share random insightful posts on philosophy. Post a video sharing a story from your life – even if it’s just about a mundane activity where you took away a small lesson. Speaking of video, try to use live video as much as possible. Facebook especially gives priority to live native video on their platform – so more people will see your content if you run it live. Coming from an SEO background and having created hundreds of creative campaigns, the ingredient within content that I always found to have the most impact socially was based on engagement. Although absolutely vital for journalists and their readers, an engaging piece of content is even more important on social as you have even less time to interest someone and deliver your message. Therefore, irrespective of the topic, the format you choose has to be one that people can digest within 3 – 5 seconds maximum. People browsing social platforms are trained to scroll and they’re looking for an excuse to continue doing so. Therefore, your content, whatever the topic, has to make them stop and digest. That’s the game. Historically, I’ve found GIFs an absolutely brilliant format for this, with a clear message being conveyed near instantly. Proprietary data offering a unique insight into a topic your users care about is also a great 2 second headline read, with a potentially lasting impact. The above is all absolutely critical if you want to users to amplify your content. People won’t share content with other users unless they too think it will make people stop and engage with them as well. Being a founder and promoting my business on social media, I learned what I should share in social media as an individual vs. what it works for my business. The most successful posts published as an individual are those which involve a deep understanding of human emotions, motivations, and psychology. Posting my learnings, feelings or fears always moved my audience and connected with them on a deeper level. Posting as a business on social media implies some rules: you need to promise a specific benefit, use numbers, ask a question, create urgency, trigger curiosity or emotion, use special characters or emoji, (branded) hashtags (if you promote your business on Instagram) or quotes. Facebook – is becoming more and more a video platform. Video marketing should be a priority for your business. Instagram – is becoming an e-commerce platform. Make sure you optimize your feed for shopping and create an aesthetic profile (choose a theme edit your photos, create balance on your Instagram feed, maintain your aesthetic in Stories ). invite people to respond or engage. Twitter – works with numbers, ask questions or create urgency with your posts. There’s almost no right or wrong when it comes to the type of content you can share on social media. The more important question is where can you share what content for the best return on investment. Simply using a social media automation tool and posting the same content to Facebook, Twitter, LinkedIn, Pinterest & co won’t bare any fruits. It is more important to find the right match between content and social media platform. Some content might be shareable on multiple platforms and other content might need to get slightly adapted for a different platform. Sometimes it just doesn’t make sense to even adapt content to another platform. In short and very simplified you try to keep photos for Instagram and Pinterest, news, blog post teasers and gifs for Twitter and videos and longer text-content for Facebook and LinkedIn. First things first, there is no Silver bullet. Different platforms have a different audience and different user expectations. For instance, videos may do well on Facebook but not on LinkedIn. You should focus on experimenting and finding out what type of content works best for your audience across each platform and then double down on what brought results. An easy way to get started would be to learn from what’s working for industry leaders in your segment and then try it on your own to decide the content that works for you.. The starting point in deciding what to share on social media – should be your clients. You must answer one simple question – what problems are they facing on daily basis and how can I help them to solve those issues? Then when you have this answer, figure out how this correlates with the sales of your product or service. The content you share should align with the touchpoints people go through when experiencing the benefits of your service. Long story short, your content should deliver this “oh sh*t, I need this” moment and help your community to realize that they can’t live without your service. The best way to do this is by drawing a timeline of each interaction people go through when interacting with your business – on-boarding, feature No.1, feature No.2, etc. Then make sure you have content to share for each interaction. And to make sure you don’t turn into an annoying substitute teacher add a cat pick or two – just to keep it fun. One word: Video. We’re living in its golden age. It’s the most efficient medium out there, as it covers a wide range of purposes: it captivates, entertains, educates, creates opinions, and so much more. The stats are undeniable, as video is shared 1200% more than pictures and text… combined!